This new edition of a successful engineering text provides an interpretation of the more theoretical guidance given in the new suite of Eurocodes for the subject of retaining structures. The book qualifies the extensive set of guides in terms of the design of these structures and provides a clear path through the process. It still discusses structural elements individually so that expertise can be applied to any situation likely to be encountered. The modifications, such as changes to surface zones, the critical steel ratio, the maximum crack spacing (flexural and imposed strain) and edge restraint, that have been introduced into the Eurocodes are highlighted and discussed in detail. The new suite of Eurocodes is claimed to be the most technically advanced codes in the world; the codes were developed with the intention of making them less restrictive than existing codes. The third edition reflects this philosophy by providing more theoretical background information and discussion, with specific reference to current and previous research, helping the reader to achieve a greater understanding and a wider application of the basic design guidance as the codes intended. 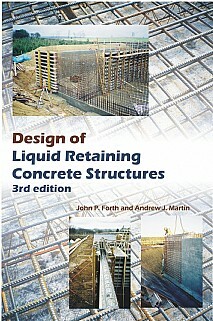 As such the book remains a vital tool for practising civil and structural engineers. Practising civil and structural engineers and postgraduate students will all find this book of particular value.